This is the strange tale of a mining company which noone admits to owning, at least not in the fareastern Primorsk region of Russia, where it is the principal source of work and income, not to mention cancer exposure, for the village of Svetlogorye (“Clear Mountain”, population 700); and where, until very recently, the mine turned out almost all the tungsten in ore and concentrate form that Russia produces each year. The mining company, Russian Tungsten (in Russian, Russkiy Volfram), is the owner of one of the major deposits of tungsten in the world. It also appears to have just passed into the control of Vasily Usoltsev (pictured), a deputy of the Russian parliament, who is avoiding questions about why the strategic mine collapsed last year; and how it happened very recently that a mining group he is associated with managed to take over the mine from an offshore company registered in the middle of the Indian Ocean, in Seychelles. Tungsten in its fabricated state, because of its super-hardness, conductivity and high temperature resistance, has many applications — from light bulbs and cathode-ray tubes to electron microscopes, rocket engines, radiation shields, bullets, grenades, and missiles. The principal mine source for the ore and concentrate in Russia is Russian Tungsten at Svetlogorye in the east. At the other end of the country, at Nalchik, in the Russian Caucasus, ZAO Wolfram is Russia’s sole refiner of tungsten metal. Details of who owns ZAO Wolfram are as hard to come by, and the owners are as shy in giving their names, as at the Svetlogorye mine.But the Wolfram smelter company acknowledges the relationship between the two. The former used to own a shareholding in the mining company, but now says it was sold. To whom isn’t disclosed. After that, and until the Svetlogorye mine stopped producing, ZAO Wolfram says that Russian Tungsten has been its principal source of tungsten ores and concentrates. US Geological Service (USGS) calculations suggest that China holds the world’s largest reserves of tungsten, about 1.8 million tonnes; and mines the largest volume — about 41,000 tonnes in 2007 and 2008. Canada and Russia are next in the USGS table with reserves of 250,000 to 260,000 tonnes; Canada mined about 2,800 tonnes last year; Russia about 3,200 tonnes, if the USGS estimates are accurate. As Chinese consumption jumped, China started importing tungsten concentrates and scrap, while the government in Beijing imposed financial disincentives for exports of most tungsten materials. In a rare interview in 2007, a source at ZAO Wolfram told Minesite that about 30% of his smelter’s output is sold domestically, while the rest is exported to the European Union, the United States, and Japan. He said the plant has built capacity to produce 8,000 tonnes of tungsten in several forms per year, but lack of imported ores has sharply curtailed production for many years. “The absence of raw material on the market leads to the problem of our inability to fully load all capacities,” according to Fyodor Fedorenko, head of ZAO Wolfram’s marketing department said. The main source for the Nalchik smelter has been the Russian Tungsten mine; as demand for Russian exports rose in 2006, imports also grew – from Mongolia, Canada, Brazil. Wolfram acknowledges that the dwindling supply of mined tungsten domestically has meant that it has had to increase imports of ore. In 2007 this was made more profitable by a Kremlin decision to remove a 5% import duty on tungsten. Both the smelter and the mine have reported better days – as they were, before the crash of last autumn destroyed the demand for steel, and thus steel alloys like tungsten. At the end of the Soviet period, Russia was turning out more than 4,000 tonnes of the metal per annum. During that time, Tyrnauz and Lermontovskiy mined roughly equal volumes to comprise the total. Over the past decade, ZAO Wolfram says it has tried to open new upstream deposits of tungsten – at Kyzyl-Tau, in Mongolia; at Tyrnauz, in the Russian Caucasus; and at Kholtoson, in the Buryat region. Prospecting at Kyzyl-Tau was called off for lack of commercial feasibility, and an equity stake in the project sold. That left Wolfram dependent on Lermontovskiy. But even before the crash, the mine at Svetlogorye was in bad trouble. In June of 2008, the mine workers went on a hunger strike, claiming they had not been paid wages from before the start of the previous winter. It is unclear what the production was for at least a year before that. According to the head of the local miners’ trade union, Leonid Otnaikin, and reports from the local and Moscow business press, the holder of the mining licence, OAO Lermontovskiy GRK (ore-mining company) went into official bankruptcy in 2004. Two years later, in June 2006, its assets were acquired by a Moscow company called Vist-Avto Center, and since that name meant quite another line of business, it was renamed OOO Russian Tungsten. “Our employer is in Moscow, nobody explains anything,” Otnaikin was reported as saying during a miner protest in June of 2008. “The enterprise doesn’t have a CEO — for last three months three CEOs were replaced. But we know about that only by reading about the orders, we did not see any one of them.” Without wages, current payments, or fresh investment from the proprietors, the mine and the village collapsed. The unions appealed to Prime Minister Vladimir Putin for a state takeover of the mine. Putin then visited the region in April of this year, and agreed with the Primorsk governor, Sergei Darkin, according to local media reports, that something would be done, and that a new proprietor would be arranged for the plant. But who owned the plant when Putin intervened? According to reports in a Vladivostok newspaper, the nominal owner was a man named Alexander Martynov, whom the newspaper tracked down to a street address in Moscow, but couldn’t find him there. Attempts by the regional authorities to find him in person also proved in vain. Notwithstanding, Martynov reportedly continued sending management instructions by email to the mine office at Svetlogorye. The instructions were to eliminate costs, fire workers, liquidate the enterprise. His authority, according to the newspaper reports, came from the chief executive of Granite Management Ltd., Annabelle Jean-Louis. Granite Management apparently owned Russian Tungsten, and was giving Martynov his marching orders. Granite Management was registered at an office in Victoria House, Victoria, on Mahe island, in the Seychelles. The takeover by Granite Management appears to have been formalized in September 2007. A Primorsk region reporter, Larisa Gerina, who has been covering the tungsten mine disaster, said that Martynov was understood in the area to be the official owner. But the person in charge at the site was another – Anton Rodionov. On March 23, this year, Gerina said it was Rodionov who gave the order to liquidate the mining operation, and lay off the workers. Rodionov claimed Martynov’s authority for his actions; Martynov claimed the authority of Granite Management. This then triggered the protests, which reached Putin’s ears a few days later. Putin told Darkin either to enforce the performance of Lermontovskiy’s mining licence, or cancel it for non-compliance with the production requirements. “If support is necessary, we will help”, Putin was reported locally as saying on his April visit. He had little option. The region, and capital Vladivostok, have been selected as the site for the summit conference of the Asia-Pacific Economic Cooperation (APEC) states in 2012. A three-year programme of capital investment to create the facilities and infrastructure has already gotten under way. Tungsten mining is no priority, but starving miners and their protesting wives near the summit site have proved to be embarrassing enough to make their claims Kremlin concerns. Putin ordered his regional representative, Victor Ishaev, to put in the fix. Ishaev has recently moved to his federal job after serving for many years as Governor of the Khabarovsk region. He is a past master in arranging the transfer of mining licences and mine company assets. In mid-June, as the tungsten mine protest hit the Moscow media, Ishaev and Darkin arranged for a new owner to take over. The Primorsk regional administration confirms that the mine workers have been paid Rb6.3 million ($203,400) in wage arrears they were claiming; this was done by a bank acting on the regional government’s guarantee. The regional branch of the United Russia political party was then assigned the task of restarting the mine. The party branch arranged for the signing of an agreement by Russian Tungsten, ceding a 5-year lease of the mine and assets to Primteploenergo, the state controlled regional energy enterprise, and one of the largest in the region. The new controlling stakeholder of Russian Tungsten has been reported locally to be OAO Dalpolimetall GMK. Dalpolimetall is Russia’s largest zinc and lead miner, with its own lead smelter and some silver production as well. Once owned by Glencore, it is reported in the industry press to be privately owned. In Moscow, industry sources claim its controlling shareholder is Vasily Usoltsev. Because he is a parliamentary deputy, he is barred from running a business on the side, but not from owning one, or acquiring assets in the interests of his business. Usoltsev, 46, says in his public resume that he was born and educated in the Primorsk region, and graduated as a radio and electronics engineer. In 1998 he says he became chief executive of Dalpolimetall, and three years later president of the management company or holding through which the mining company was owned. In 2002, he took a seat in the regional parliament, and in 2003, he moved to the State Duma in Moscow, where, today, he is deputy chairman of the committee for the northern and far eastern territories. For a member of parliament, Usoltsev is unnaturally untalkative. 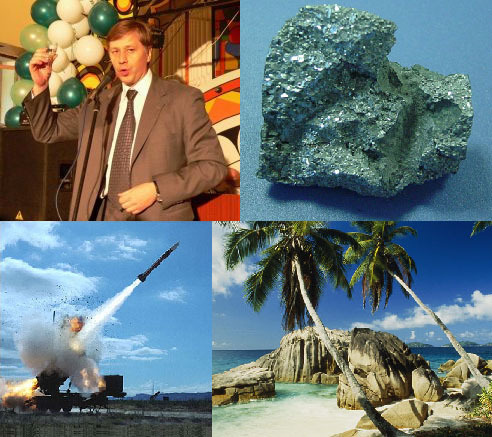 He refuses to answer questions about his relationship to Dalpolimetall, or his involvement in the purchase, sale and lease transactions that have involved Russian Tungsten and the Seychelles company, Granite Management. Svetlana Taisayeva , a member of Usoltsev’s parliamentary office in Moscow, told Minesite she cannot say whether Usoltsev now holds a 50% stake or more in Russian Tungsten. Over several days, she claimed that Usoltsev was in Vladivostok, and would reply himself to Minesite’s questions in time. He has not. If Usoltsev is the controlling stakeholder in Dapolimetall, he appears to have known what was happening at the mine for months before the miners sought Kremlin intervention.According to Russian company registration records, OOO Lermontovskiy Mining Management was recorded on December 30, 2008, with authorized capital of Rb50,000 ($1,500). The stock of the company – apparently not the same as OAO Lermontovskiy GRK – was divided between OOO Pacific Company of Vladivostok and OOO Impex-Trade of Moscow. Another company called Fintex Capital Management Inc. is also registered as a stakeholder; it is an offshore registration, based in the Seychelles. Impex-Trade has been reported in the Russian press as connected to Dalpolimetall through Vitaly Gedz, who reportedly holds management positions in both companies. Ishaev and his spokesman, Yevgeny Anoshin, were asked to clarify reports that ownership of the Svetlogorye mine is contested between Martynov and the principals of Granite Management on the one hand, who say they own OAO Lermontovskiy GRK; and Usoltsev, Gedz, and others in the Dalpolimetall group, who appear to own OOO Lermontovskiy Mining Management. The former is the mine licence-holder; the latter would like to have it. Although regional authorities and mine union representatives say they have been trying to make contact with Martynov for months, Ishaev has said publicly he has spoken with the owner of the mine, and reached an agreement with him. Ishaev refuses to say which owner he is talking about. It is clear that a transfer of operational responsibility has occurred to the benefit of the Dalpolimetall group. It is also clear that the payroll costs at the mine, and possibly other operating expenses as well, have been moved on to the regional budget, through Primteploenergo. Whoever owns the mine ought to be free to restart production and sales. Russian mining legislation authorizes revocation or cancellation of a mining licence. But when that occurs, the state is required to put the licence up for an open bidding auction. If it had been anyone’s intention to take over Russian Tungsten and Lermontovskiy GRK at the lowest price possible, without triggering an open reserves valuation and competitive bidding for the asset, then the temporary leasing arrangement signed last month appears to do the trick. But who benefits is a question that may only be answered for sure a long way from Svetlogorye – in the Seychelles.